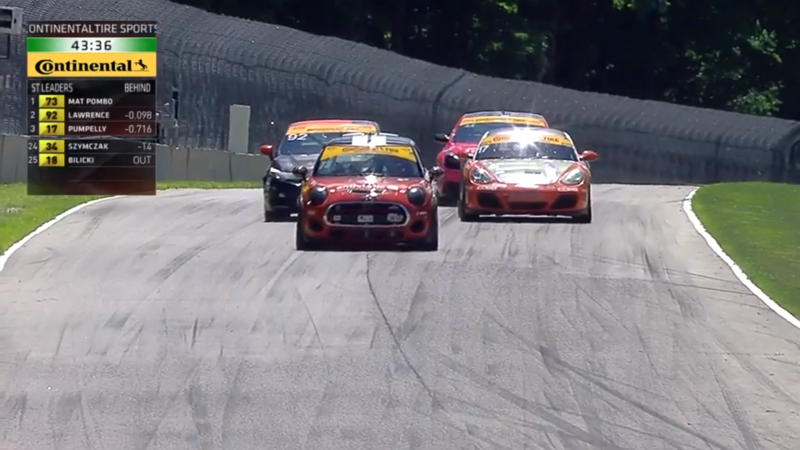 The Continental Tire Road Race Showcase had action from the very beginning to the end. Just six minutes into the event the full course yellow came out for a nasty accident between two GS class cars. The accident saw one car end up on its roof and the other on its side. While it was a scary looking incident both drivers were fine. Just before that incident the #52 pitted due to an issue with a data cable in the car. While they were there they topped the car off but would rejoin the race at the tail end of the field. After a half hour Derek Jones had worked the #73 up to fourth place. Shortly after getting there he found himself off course but luckily didn’t hit anything. Jones fell back to 12th and continued on. Mark Pombo opened the race for car #37 and made steady improvement throughout the first half hour. After 35 minutes he had worked himself up to 7th place. With just under and hour and forty minutes left many in the field pitted under a full course yellow. The #73 pitted and had a slow stop. With Mat Pombo now behind the wheel they rejoined the race at the back of the field. The #37 stayed out and Mark Pombo continued his drive toward the front getting as high as 5th place. The race saw yellow after yellow as there were a lot of incidents throughout. Unfortunately this makes it difficult to gain positions. But since only a few ST class cars pitted in the early caution Mat Pombo in the #73 found himself in third place after the second round of pit stops completed. Mat Pombo seized on this opportunity. With 57 mins to go he worked himself in to the lead. The #92 Civic kept the pressure up on the #73, not allowing Mat Pombo to relax for a minute. Mat fought hard though, at one point holding off 3 cars while going through corners. Mat Pombo held the lead for roughly 15 minutes before Spencer Pumpelly could work his way by. #73 flying past the starter stand after just taking the lead. The #37 hits the wall. Ethan Low was behind the wheel of the #37 with about 25 mins left when he had hard contact with the wall. He was able to drive the car back to the pits but that was the end of the day for the #37. Mat Pombo continued working hard, holding down second place all the way down to the final lap. Then disaster struck as the #73 had a brief fuel hiccup sending the car into limp mode. 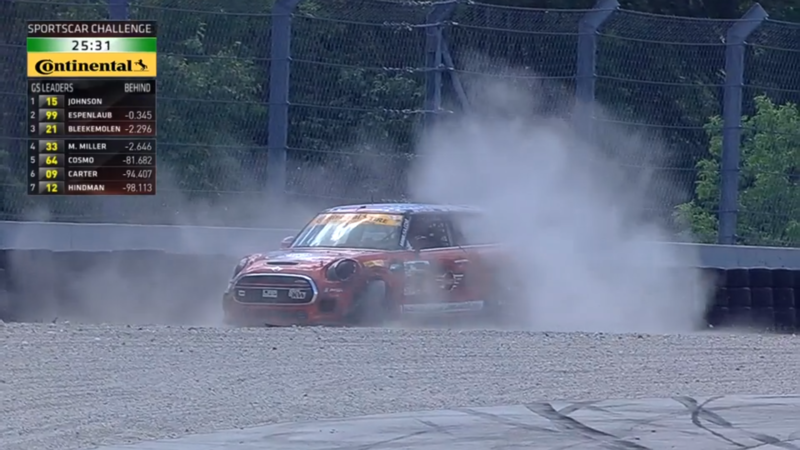 This put an end to the MINI JCW Team’s chances for a podium. Mat was able to coast to end and finished in 7th. The #52 had a quiet race but the combination of Ramin Abdolvahabi and Nate Norenberg brought the car home in 12th. 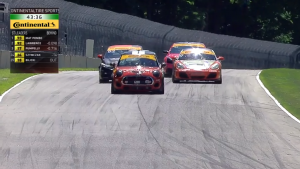 Road America proved to be a strong race for the team. They’ve got the speed, strategy, and drivers to win a race. Now they just need a bit of luck. MINI Results are below, full field results can be found here. The next event is in two weeks at VIR, don’t miss it! Update: Corrected information on issue #73 car experienced at the end. 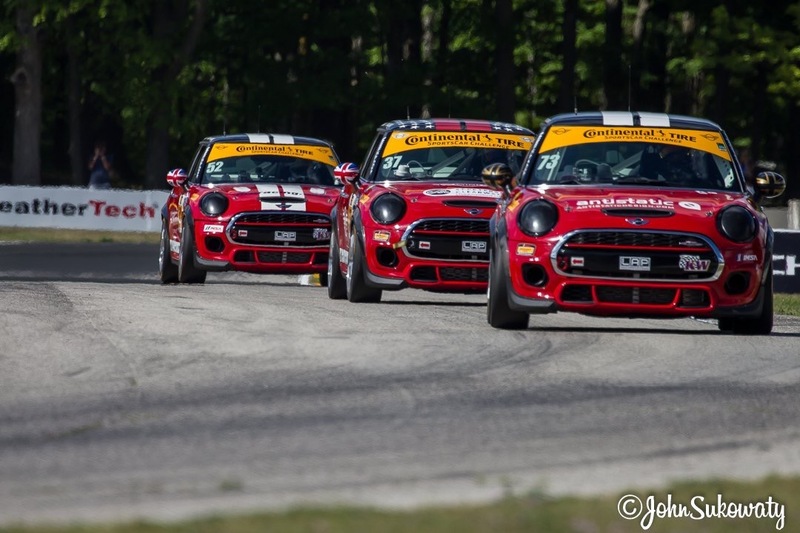 ← It’s Race Day at Road America!